Babies love repetitive play, and these colorful beads offer stimulating fun while exploring different vehicles and strengthening developing skills. 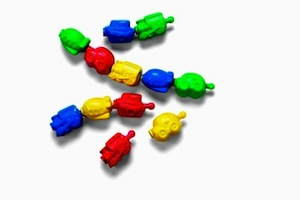 Set includes 12 beads in fun shapes that snap together and pull apart over and over again. Beads can also be used on the Big Discoveries Table, sold separately. Beads measure approximately 3" each.